It looks like Disney and Warner Brothers will soon be in the market for a new barrel, as the one they currently have is almost bottomless from scraping so hard. According to NikkiFinke.com, nearly 20 years after Father of the Bride 2, development is underway for Father of the Bride 3, with Steve Martin returning to play “George Banks”, said father of the bride. Director Charles Shyer will write as well as direct this time, since Nancy Meyers is too busy making movies about post-menopausal Goopy Paltrow types. Father of the Bride was about old-looking George Banks freaking out over his daughter’s wedding, and Father of the Bride 2 had even older-looking George Banks freaking out over his daughter and his wife getting knocked up, so I was hoping that 20 years later we’d be treated to seeing a Methuselah-looking George Banks freaking out over ordering online viagra, but instead he’ll be freaking out over his gay son’s wedding. So far, the plot is about George’s 29-year-old son Matty Banks (played in both FOTB 1 & 2 by Kieran Culkin) getting married to a dude, and George starts freaking out (because apparently this movie takes place in the 90s just like the first two? ), so his wife kicks him out of the house. And let me guess: he goes and stays with Martin Short? 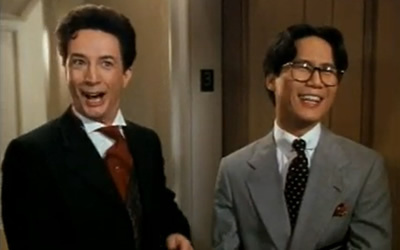 Speaking of Martin Short…obviously this movie will be a stinky turd, but if they wanted to save it, they should change it from the wedding of Matty Banks to the wedding of Franck the wedding planner to his assistant Howard. If you’re going to make people watch a dude freak out over a gay wedding for 90 minutes, at least make it Martin Short flipping out like the middle-aged Bridezillas on Say Yes To The Dress.